Buy Mosquito Sticks , from Coghlan's Ltd for $4.99 only in My e-commerce. 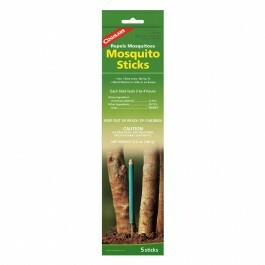 Mosquito repellent (D-Cis trans allethrin) molded on a stick that can be inserted upright into the ground. Each stick will burn approximately 3 - 4 hours. Weight: 6.3 oz (180 g) Five sticks per package.